While the American Civil War was raging, Abraham Lincoln lost his 11-year-old son, Willie to typhoid. It is said that for a few nights after Willie’s death, Lincoln, grief-stricken, used to go to the crypt to hold his son’s body. 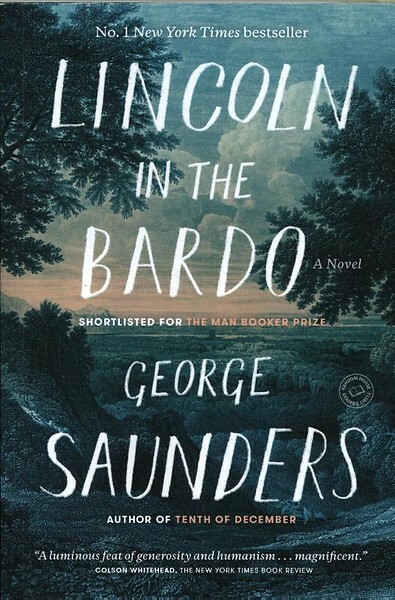 George Saunders takes this sliver of history and builds a multi-faceted, multi-voiced story around it. The entire book is constructed of fragments—some are extracts from existing material but the bulk of it made up of voices of the dead in the cemetery, dead who are still in Bardo, the Tibetan term for a place of transition after death. It reminded me of Edgar Lee Master’s Spoon River Anthology, where the dead rise up to tell their stories. Our guides for most of the book are two of the ghosts: Hans Vollman, a printer who left behind a young wife; and Roger Bevins III, a gay man who committed suicide when his lover rejected him. They are joined by the Reverend Everly Thomas, who had crossed over into the afterlife but fled to the Bardo when he realized he was being sent to hell. He never got over the horror of what was awaiting him. Although Willie, being a child, should move on, he stays so he can be with his father. However, the children who stay end up by being attacked by vile beings who bind them down with tentacles, so the three men decide to try to persuade Lincoln to let his son go. Given the obstacles in communicating with the living, this is not an easy task. This is an incredible work of imagination—not just the premise but the way it is written. The dead in the cemetery cannot wander too far from their bodies and don’t seem to realize they are dead. Coffins are called “sick boxes” and graves “sick mounds”. Their manifestations emphasize the way they lived their lives: a miser with several properties worries constantly about their state and has to float horizontally, pointing like a compass to whichever property he was thinking of; a young black woman brutalized and raped is voiceless; and Everly Thomas has protruding eyes and hair standing on end from the time he glimpsed the horrors of the “diamond tent”. The style took a while to get used to but once I did, I was hooked. There are, as I mentioned earlier, two kinds of chapters: the historical ones, which are composed of extracts of a couple of lines or so from books or contemporary accounts and often contradict each other. But for me, the richness of the book lies in the other chapters, where the dead come alive, so to speak, and tell us their stories. And it brings home the fact that we all have stories to tell.